July 31, 2017 — NSW Environment Minister Gabrielle Upton today announced that a joint venture between Cleanaway Waste Management Ltd, Australia’s leading total waste management company and TOMRA Systems ASA, has been appointed the Network Operator for the New South Wales Container Deposit Scheme (CDS). The joint venture between Cleanaway and TOMRA will provide handling, transport, processing, recycling and data services from reverse vending machines as part of the CDS in NSW. The CDS is scheduled to commence on 1 December 2017. 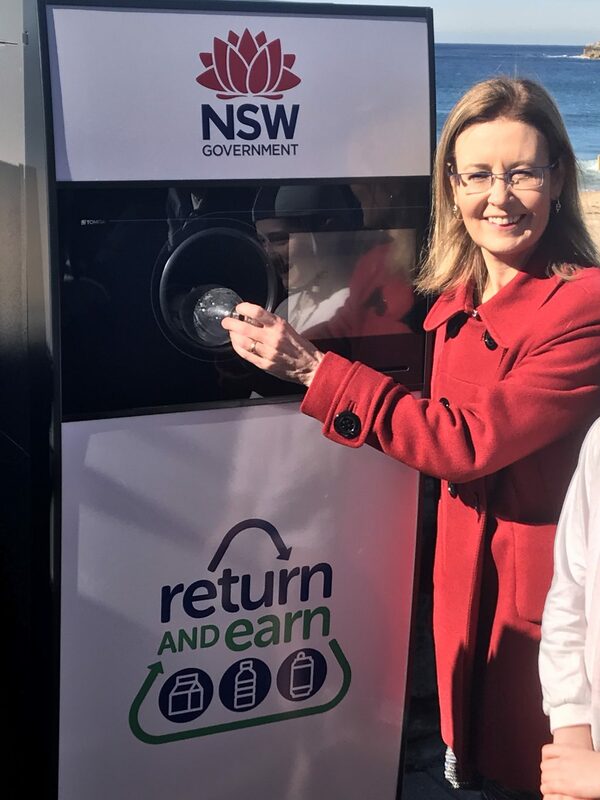 NSW Environment Minister Gabrielle Upton at the announcement of “Return and Earn” at Coogee Beach, NSW. The reverse vending machines to be provided by the joint venture allow consumers to return their containers and to collect an electronic refund, to donate the refund to a charity, or to obtain a voucher from one of the ‘redemption partners’ which can be used as credit in store or redeem for cash. Collected containers will be processed through a counting and sorting centre in western Sydney. The containers collected will be recycled and sold into both domestic and export markets. CEO and Managing Director of Cleanaway, Vik Bansal said: “The NSW government should be applauded in developing and bringing to fruition a world class container deposit scheme. “As leaders in logistics and resource recovery, Cleanaway are proud to be involved in the CDS for NSW, and help them achieve their environmental and sustainability goals. “By partnering with an innovative leader like TOMRA, we’re leveraging the experience of the global leader in reverse vending technology to deliver these services in New South Wales. Environment Minister Upton said: “This is the biggest initiative to tackle litter in the state’s history and it will make a massive difference to the amount of rubbish on our streets, parks and waterways right across NSW. In conclusion, Mr Bansal further stated: “With TOMRA we remain keen to work with other states of Australia that are currently considering implementation of similar schemes.